Edge Towers Condos - Register today for Platinum VIP Access! 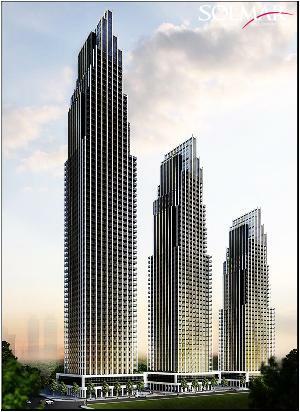 Edge Towers Condos is a new mixed-use condominium development by Solmar Development Corp. coming soon to 24-64 Elm Drive West in Mississauga, Ontario. The proposal consists of three residential buildingdesigned by Cuismano Architect. Edge Towers Condos is located in Mississauga which is the sixth largest city in Canada situated by Hurontario Street and Elm Drive West in the downtown core. A very multicultural city that is still growing where 52% of the population speak another language other than English. This development site is located near Highway 403 and is located by the future proposed Hurontario LRT which is a light rail transit line that will extend from the Port Credit GO by Lakeshore Road East to the Brampton GO near Queen Street East. "Metrolinx and the cities of Mississauga & Brampton are developing an efficient transit system, to build vibrant, safe, prosperous and connected communities." Edge Towers Condos is situated close to the Square One Shopping Centre which is Mississauga's premier shopping centre with over 360 retailers and services and includes brands such as BCBGMAXAZRIA, Harry Rosen, Lacoste, Marciano, Michael Kors, Pandora, Rudsak and Swarovski. Also located nearby is the Living Arts Centre, the Mississauga Centre, the Mississauga Central Library, the YMCA of Greater Toronto-Mississauga, the Sussex Centre, Pladium and the Mississauga Valley Community Centre. Edge Towers Condos is also located close to schools, parks and restaurants such as the Bier Markt and Spring Rolls. The Cooksville GO Station is also located not too far away. Register with us today for your Platinum VIP Access to the Edge Towers Condominiums by Solmar Development Corp.!